Gift will name the Michael Kaminsky Intramural Park. New York investment expert and Emory University alumnus Michael Kaminsky, a 1989 honors graduate who was active in intramural sports at Emory, has made a $1 million gift to the university's intramural athletics program. Half of the gift will fund improvements to Emory's intramural fields and facilities, which will be named the Michael Kaminsky Intramural Park, while the other half will establish an endowment for the intramural program. "On behalf of all of our students and campus life staff, I thank Michael Kaminsky for his generous gift. This will make the intramural park a special place for school spirit and campus community building," says John Ford, Emory's senior vice president for campus life. "Michael's athletics experience as a student at Emory gave him a very real understanding of the benefits of experiential learning and leadership opportunities through intramurals. His generosity will allow us to provide these opportunities to the Emory community in a way that represents the proud Emory tradition of ‘Athletics for All,'" says Tim Downes, the Clyde Partin Sr. Director of Athletics and Recreation. Kaminsky, a managing director at investment firm Neuberger Berman Inc. in New York City, grew up on Long Island and chose Emory for his education after visiting in 1984. He said he appreciated the diversity of the faculty and student body, the beauty of the campus and its location near a larger city, and the rigorous academic standards. He graduated with high honors as a history and political science major. Kaminsky chose to make the gift because intramural sports were so important to his own college experience and that of many other students. He played intramural baseball, football, and basketball while an Emory student and served as sports chairman of his fraternity, Alpha Epsilon Pi. "It's meaningful to me that I'm helping improve campus life at Emory," he says. 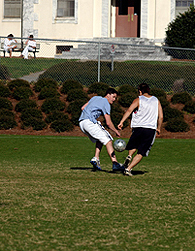 "Intramurals at Emory offer a unique experience. Helping continue that experience and improving the fields will be important to the university." In collaboration with Marla Whitman Kaminsky, a 1989 Emory College graduate, he decided to make the gift in honor of his brother-in-law, Todd Whitman, a member of the Emory class of 1993 who passed away during his senior year; and Harris Silver, also a 1989 Emory graduate and a close friend who passed away in 2003. The gift is part of Campaign Emory, a $1.6 billion fundraising endeavor that combines private support and Emory University's people, places and programs to make a powerful contribution to the world. Investments through Campaign Emory fuel efforts to address fundamental challenges: improving health, gaining ground in science and technology, resolving conflict, harnessing the power of the arts and educating the heart and mind.